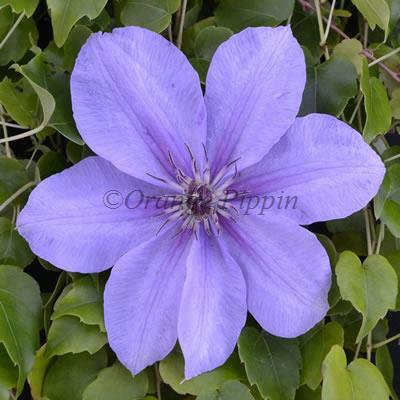 Clematis 'Blue Eyes' has masses of pretty, sky-blue/lilac flowers with white centres which are freely produced during May and June then again in August and September. This wonderfully compact growing, non-evergreen climber is perfect for the smaller garden, grown in a container, over fences, wall, pergolas, trellises, natural support- such as a large shrub or tree or to brighten up the terrace or balcony. Clematis 'Blue Eyes' was raised by Ken Pyne, England around 1999.